The Legend of Snoqual | Where's my backpack? I have travelled the stretch of I-90 that leads east from Seattle over Snoqualmie Pass so many times that I can close my eyes and see each twist and turn of that heavenly climb into the Cascade Mountains. I’ve also hiked trails around Snoqualmie Falls; an impressive 276 foot waterfall that is a sacred site for the Snoqualmie Tribe. Their name translates as ‘people of the moon’ and they regard the waterfall as their birthplace. I relish the name Snoqualmie; it sounds like snow, which is entirely appropriate for the pass where Seattleites take to the slopes in winter armed with skis and snowboards and inner tubes. So when I was walking through Lower Queen Anne recently and spotted a piece of public art bearing the title “Snoqual/The Moon Transformer” I had to stop and find out more. 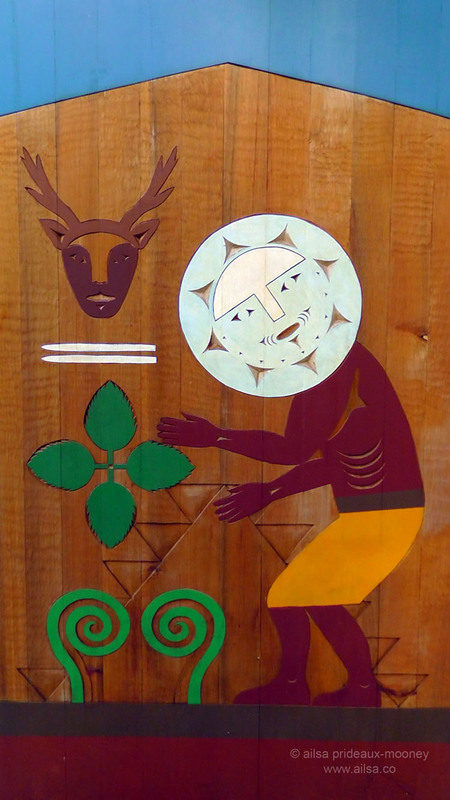 Artist Roger Fernandes carved and painted cedar panels that depict events in the story of Snoqual, a legend shared by many Salish tribes in the Puget Sound area. 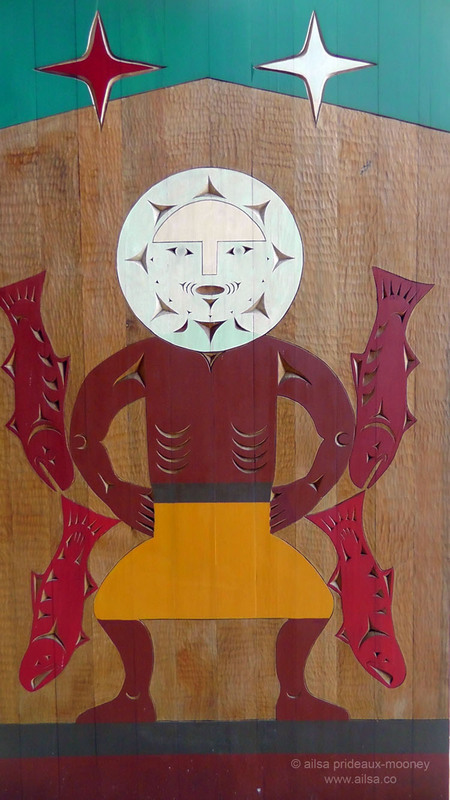 The panels are joined by an overhead cedar panel creating an archway you can walk under, suggesting the structure of cedar longhouses; the traditional dwellings of local tribes. If you have a chance, take a walk under Snoqual’s arch at the cross streets of Thomas and 3rd Avenue West in Lower Queen Anne, just by the entrance to the Thomas Street footbridge. And if you happen to catch a glimpse of Puget Sound while you’re here, you’ll understand why Moon decided to stay. It really is beautiful. This entry was posted in Photography, Travel, United States, Washington and tagged art, history, photography, photos, pictures, travel, writing. Bookmark the permalink. A very informative and entertaining post. The photos really illustrate your message. Very interesting ailsapm, I drive over Snoqualmie pas regularly as I did yesterday. Now, I will think differently about it when ever go over. Wow that’s a great story I love hearing tales like this. Thanks for sharing! These are fabulous photos and carvings! Thanks for sharing this history. Where did you find this story? 🙂 It’s wonderful. The carvings are even more lovely. Are these panels in Seattle, or somewhere else? Thanks for sharing this history Alisa. Now I have to look for the arch! Neat artwork and legend. Thanks for sharing! I love this Ailsa and it great to see an interpretation of the myth displayed for everyone. What a lovely story of the legend of Snoqual. These stories from the past are so wonderful to read. Your photos of their artwork are great also! Great stories to share, Ailsa! Love the artwork. I can just imagine the tribes from long ago sitting around the fire as the moon rises and telling that lovely story to their children.